First thing’s first: over on BoardGameGeek the auction for the Jack Vasel Memorial Fund is raising a huge amount of money and you should check it out. It is a great way of giving back to the gaming community. And I know the gaming community is worth giving back to because we’ve met many of you, and know you to be friendly, welcoming, and supportive people. If you’re interested, you can find it here, and you can bid on a guest appearance in a Tiny Wooden Pieces comic here. If you are the highest bidder when the auction ends, we will also ship you signed, colour print of the comic in which you appear. If you are one of the many who have already bid so generously on this item, I would like to thank you. After which brief detour we return to the uncrowned king of the Living Card Game, the titan that is Android: Netrunner. I’m sure all of you who don’t play it will have been nodding along to this week’s comic, smiling knowingly at the all-too familiar situations and conversations. And maybe even the recurring nightmares, though that might just be me. Of course, those of you that DO play Netrunner will be sitting back in your swivel chairs, cutting a deck in one hand, stroking your white cat with the other, knowing that resistance is futile and eventually we will all be worn down by the reviews, ratings, ravings, podcasts, websites, blogs and shelf-space afforded to Netrunner. That our finely-tuned aversion to collectible games can be short-circuited, our love of boards above decks can be bypassed, and our suspicion of anything so universally praised can be disappeared in the darkest corner of a remote server farm, never to be heard from again. In fact, just this week Tiny Wooden Towers, home to both of us and our studio (of the haphazard, home grown variety) had been breached. We finally broke down and under the entirely hypocritical pretence of necessary research for this week’s comic, purchased a copy of Netrunner. More to follow as this story develops, and we actually get a chance to play it. 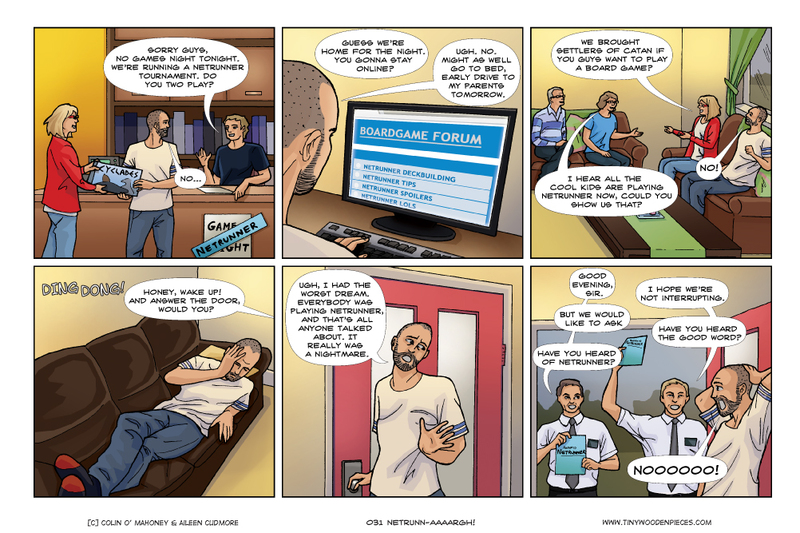 Wow, I’ve never seen such a spot on parody of myself until I read the last panel of this strip. Amazing series! Keep up the great work! Thanks for the kind words, we’re so glad that you’re enjoying the comics! Muahahahahahaha!!! You will join the cult, precioussss. Ah yes, having now finally played a couple of games, all I want to do is play more Netrunner! Before I fell to the dark lord Netrunner I knew this very well. I would go to a game night at my game shop and this would be all people were playing. I think how it got me was that it does not feel all that collectible. Since you know what is in each pack and everything you can just buy the stuff you want for the factions you play. And you are still plenty competitive even with just the base set if you are just playing casually. Although this may be the Stockholm Syndrome talking.